Q: Why should I be optimizing for Amazon? Q: Some guides say that you shouldn't repeat your keywords, yet you say to repeat them multiple times? Our On Page Analyzer tool guide is here! 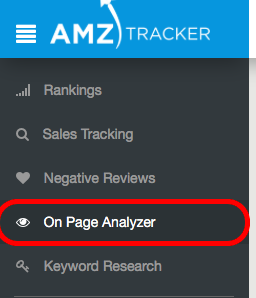 You can find the tool by clicking on the 'On Page Analyzer' text in the menu on the left. The On Page Analyzer tool will help you to ensure that your Amazon listing is optimized perfectly for the keywords you are targeting. Why not take the guesswork out of optimization, and instead help yourself to get higher products ranking in the Amazon search engine in no time. A: When A customer searches for a product in Amazon, you want to give your product the best chance to appear in as many search results as possible. And you want to be as high as possible in these search results so that it's more likely your customers will find you. 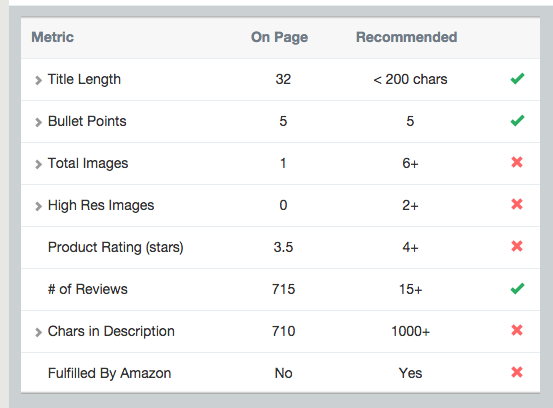 So you want to be optimizing your product listing for the keywords your targeting and want to rank for in Amazon. This is similar in nature to optimizing websites for Google SEO, except the tool is tailored for the Amazon search algorithm. A: No one knows the Amazon algorithm with 100% certainty of what is looks for! But, the evidence shows that our methods which we have shared with you are superior. We recommend to look closely at the most competitive niches (i.e. Garcinia, Raspberry Ketones, etc) and copy what they do because it's working. All of these types of products follow the exact strategies we outline.